Beverly is a T-12\L-1 paraplegic mother. She is constantly fighting battles and overcoming obstacles. Follow her life and share her experiences as a paraplegic mother, wife and employee. Everyday is not always perfect but she always pulls through. 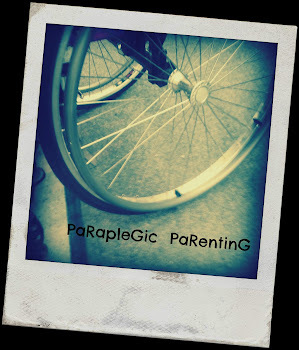 Find action packed drama, romance and comedy as you follow ParaPleGic PaReNtinG. Let's get one thing straight here: I don't feel sorry for myself because I'm in a wheelchair. I am human like everyone else and have my moments of frustration. There are somethings however, that I have or will encounter that really bother me. On this page you will find my Para Peeves. Enjoy! A Para Peeve is a minor annoyance that a paralyzed individual identifies as particularly annoying to them, to a greater degree than others may find it. I recently went to Wal-Mart with a friend and was reminded how annoying somethings can be. While I was trying to put my wheelchair together and get out of the car my friend pointed out that there were 2 different people watching me. I looked to my left and there was a car load of people watching. I looked behind me and there was a man standing there watching. All I wanted to do was get out of my car and go shopping. I know people are curious. I also know that people can be rude. Not knowing which of these would be true to the "stalkers" I decided to be nice. Once I put my chair together and got myself situated I turned to each "stalker" and waved. This was my way of letting them know "Hey, I see you watching me, now you can stop." There are alot of able bodied people who will never understand why this bothers me. Just imagine that people are watching you everywhere you go while doing everything you try to do. It's similar to having a stalker. Lesson of the day folks, if you want to stare please be discreet about it. Please don't gawk at people in wheelchairs. Just because we can't walk doesn't mean we don't see you. Ok, so this is probably one of my biggest para peeves. EVERYONE does this to me and doesnt realize it. It really annoys me when people who can walk leave stuff laying in the middle of the floor in my way. Note to able bodied people that know wheelchair users: Just because you can step over your dirty clothes in the floor doesn't mean that we can. My husband does this to me almost everyday. He will come home and take off his shoes and leave them in the middle of the floor. As soon as I need to speed around the corner to get the phone or a rambling child I am suddenly and without warning stopped by some nasty shoes. I'm suprized I have gotten whiplash by now. My son is following in his fathers footsteps as well. I can't tell you how many times I have backed up and almost flipped over backwards due to a toy truck being behind my wheel. When I was younger and lived with my sister I was constanly getting stuck on LEGOS that her kids left behind. It's because of this that I do NOT like LEGOS. Everytime I had a chance I was throwing away my nephews LEGOS. Being the nice sister that she is, my sister has bought my son LEGOS for both birthdays. Needless to say, he doesn't play with them much, because mommy can't seem to find them. Lesson of the day here folks is that #1-Babies, put your toys in the toy box please and #2-Husbands, pick up your mess! My life and yours is much safer that way. I know most people never think about doing this, but another para peeve of mine is when someone spits saliva or gum on the ground. If I am rolling along and not paying attention it is possible that I could wheel over this mess. I personally don't want to get another persons spit or gum on my wheels and hands. Note to wheelchair users: pay attention to the ground. I can't tell you how many times I have wheeled over nasty things. Lesson of the day people, PLEASE don't spit anything on the ground. Atleast try to aim for the bushes or something. Oh, Beverly, you are a woman after my own heart! I just discovered your awesome blog and hope to dive deeper into it in the coming days as I have a LOT of time to catch up on. Like you, I was paralyzed at the grand old age of 14 here in Texas where I currently reside. I would love to speak with you more about our experiences and share some stories. We have a lot in common from what little I have read about you! Please contact me at keith.nicole@gmail.com. I also hope to send you an email soon. It's nice to have someone to relate to. I will be sending you an email soon! Thanks for stopping by. I TOTALLY know those WalMart stalkers! I stare back. One of my. Favorite t-shirts says "Keep staring. I might do a trick." :) But hey...how 'bout dog sh*t on the sidewalk? That has happened to me more than once. Blegh! I can really relate to these, and it's nice to see I'm not alone. (I am also T12/L1.) It really is an able-bodied world, isn't it?! Follow Paraplegic 's board Wheelchair Wedding on Pinterest. How do Paraplegics Drive if they can't use their legs??? I am a 29 year old paraplegic. I have been paralyzed for over 15 years. Everyday in my life is a new adventure. Follow me in my everyday obstacles as a paraplegic mother, loving wife and frustrated employee. I live my life to the fullest and try to enjoy every minute of it. I dont let my disability stop me or change my goals. I plan to use my experiences to help others and change the public perspective of people with disabilities.